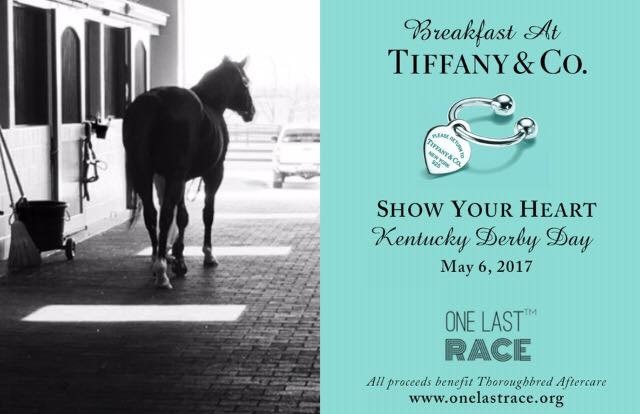 Chicago, IL - April 21, 2017 - One Last Race, a 501(c)(3) nonprofit organization, is hosting a “Breakfast at Tiffany & Co. on Kentucky Derby Day,” to raise funding for the care of former racehorses. The event is scheduled to take place between 8:00 a.m. to 10:00 a.m. on Saturday, May 6, 2017 at the Tiffany & Co. store, located at the Old Orchard Mall in Skokie, Illinois. The address of the event is 4999 Old Orchard Shopping Center, Skokie, Illinois 60077. Tiffany and Co. is opening its doors on Kentucky Derby Day to host their fabled “Breakfast at Tiffany’s” in support of One Last Race. The event will offer lively DJ music, as well as breakfast creations from our caterer, which includes Shrimp and Grits, French Truffled Eggs and Mini Biscuits and Gravy. Guests of legal drinking age will also enjoy champagne as part of their breakfast experience. Tickets are available for $75 per guest. One Last Race is dedicated to helping former racehorses in need of rescue, rehabilitation, retraining and rehoming. The organization provides Thoroughbred rescue and retirement organizations with monetary assistance to care for their horses and transition them into a second career. Through their public awareness campaign, the organization has received support from many famous racehorses, including Triple Crown Winner American Pharoah, as well as several past Kentucky Derby winners. For more information on One Last Race or this event, please visit www.onelastrace.org or call 312.461.0400.